Select the dinner course and room type for your stay. For the dinner course, we offer a delicious selection of authentic Kaiseki dinner courses; Gunma specialty pork hot pot Kaiseki dinner course, Gunma Wagyu beef Sukiyaki/Shabu-shabu hot pot Kaiseki dinner course, or Gunma Wagyu beef steak Kaiseki dinner course. This is a plan for special occasions; we offer a variety of plans to accommodate our guests. For example, we offer a couples plan to celebrate a special day, plan for groups, and plan for solo travelers. A special plan to enjoy Shojuen’s selection of special new year course meals. 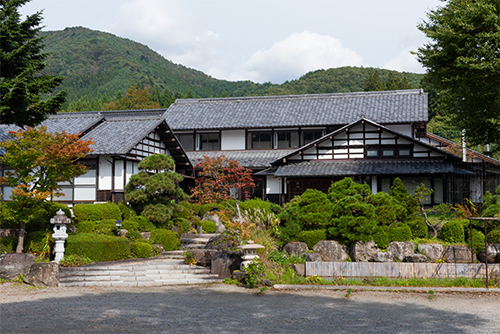 Welcome the new year with your loved ones in our hotel on a calm Japanese countryside. Shojuen is located in Joetsu-Kokkyo, the prefectural boundary between Niigata and Gunma prefectures. This movie will take you on a tour of our hotel, surrounded by authentic Japanese countryside views. Shojuen has 13 guest rooms, and all of which are located on the ground level. Please enjoy a relaxing moment in the natural essence of the Japanese countryside. Modern Japanese Suite (430 sqft). This room has 1 bedroom with 2 twin-size beds (10 jou ), 1 Tatami room (6 jou ) and 1 Hori Kotatatsu* room (6 jou ). Japanese Authentic Suite (430 sqft). 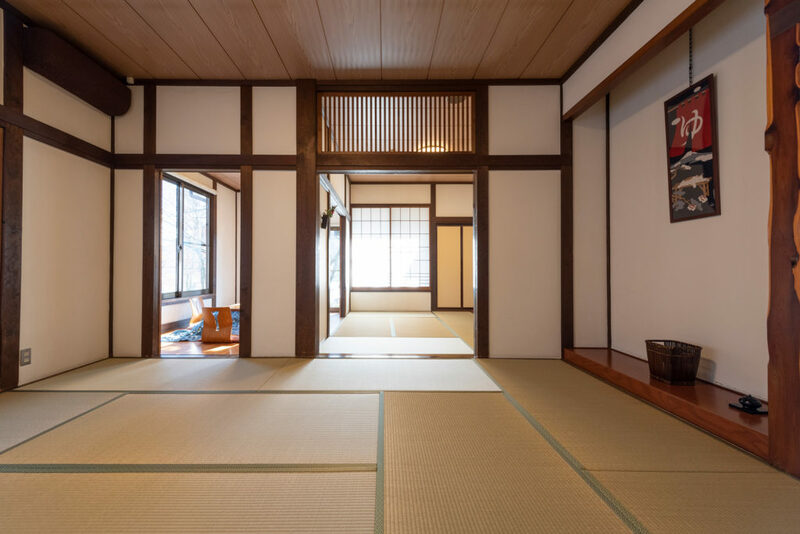 This room has 1 large Tatami room (10 jou) , 1 small Tatami room (6 jou ), and 1 Hori Kotatsu* room (6 jou). Japanese Authentic Standard Room (270 sqft). This room has 1 Tatami room (8 jou) and 1 Hori Kotatsu* room (6 jou). Japanese Authentic Studio Room (270 sqft). This room has 1 large Tatami room (14 jou) with Hori Kotatsu* . * Hori Kotatatsu is a Japanese traditional sitting area with special heating equipment to keep your body warm as you sit and relax. its bountiful variety of fresh and local ingredients. We have a great appreciation for our locally-grown fresh ingredients, and offer countryside style Kaiseki courses to highlight their quality. Our indoor baths and stone outdoor baths are located on rock walls cut from Omine mountain in the east. We also offer two private baths called “Asahi” (sunrise) and “Yuhi” (sunset). Our water comes from the rich 50 degrees sulfate water springs that have flown throughout Sarugakyo for ages. The colorless and transparent hot water is known for gently moistening your skin.